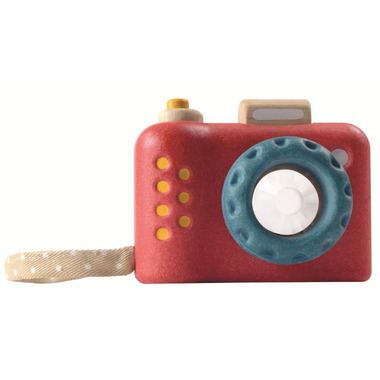 Learn to take pictures with this Plan Toys Camera! It features a kaleidoscope viewer, click button and hand strap. Measures 4" x 3" x 1.25". Cute and I love the kaleidoscope feature. A little hard for my 22 month old to hold but it does say for 2+ so hopefully she will grow into it. I like that the button makes a satisfying "clicky" sound. Great quality! Plan Toys never let me down! My daughter loves this! She is 2.5 and loves to pretend to be a photographer like mommy. Love that it's fun to look through, the shutter presses down but makes no noise. Very solid!